For those who don't know, my house is a sports house. That is if there is a sport on being broadcast, chances are it's on my tv. Football, soccer, tennis, baseball, rugby, darts, snooker, basketball, you name it, we are probably watching it. 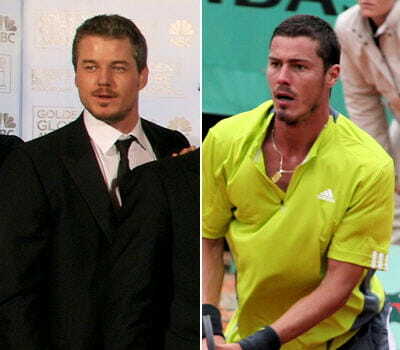 So yesterday we were watching some sort of tennis and I see this guy who looks dead on McSteamy. He does, right? Marat Safin is a Russian tennis player apparently known for his fiery temper. I'd never heard of him or his sexiness; NBH says he used be really good, but he had some sort of mental break and is either really good or really crap now. Dude totally split his racket in two after getting his serve broken and you know me, I love a bad boy. I don't know who he is but hes definitely hot! My ex has the same last name. Weird. That would be McSteamy No? OMG, I remember watching him awhile ago. He is definitely the hottest tennis player around!